IRS Tax Attorney Naperville: CPA or Lawyer? 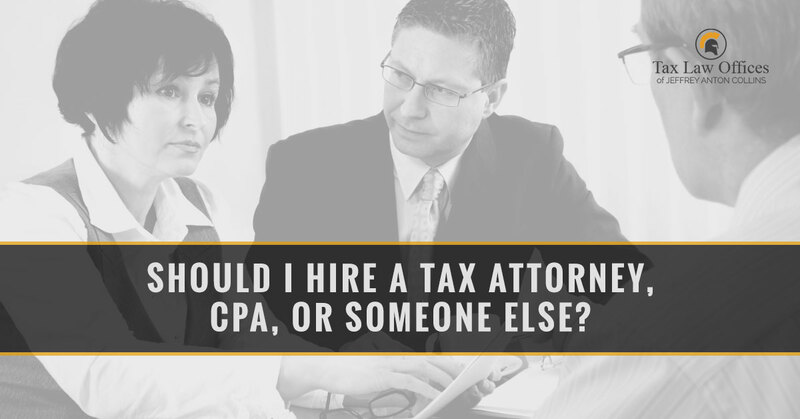 Should I Hire a Tax Attorney, CPA, or Someone Else? You might be well aware of the fact that you require the assistance of a tax professional, but where exactly should you turn? Could an accountant help you better, or are you in need of an IRS tax attorney to help you recover from an audit? Today, we would like to talk to you about the different types of tax professionals available to help you so that you may be better equipped to choose one who can meet your needs. Tax attorneys, such as those at Tax Law Offices, are highly specialized and knowledgeable when it comes to the little details of IRS tax code. We are here to give advice about how to proceed legally, particularly when it comes to trusts, tax disputes, and business tax law issues. The right tax attorney will have experience working with the IRS and be prepared to help you work to receive the best possible outcome for your case. Keep in mind that we are not accountants, however, so a professional accountant should be hired when it comes to successfully preparing your taxes. You are looking to start a business, and you need legal counsel about how to handle taxes for your company. You work in international business and need to know how to handle tax treatment and contracts. You intend to bring a suit against the IRS. You are under criminal investigation by the IRS. You have committed a tax crime and are seeking the protection of attorney-client privilege. If you are concerned that your issue might reach tax court or if you were charged with a tax crime, you certainly should consider hiring an attorney. Unlike all other tax professionals, these people maintain attorney-client privilege and cannot be forced to testify against you or provide your information to third parties. A certified public accountant, or CPA, is someone who has been trained specifically to maintain both business and financial records. These professionals are a great option if you are looking for someone to help you prepare your taxes, make sure you are complying with tax code, and even file or correct your tax returns. These are very beneficial resources! CPAs can also represent you in front of the IRS if the need arises. They can also provide financial planning services, and many offer additional tax strategy help for both personal and professional finance concerns and questions. An enrolled agent is someone who specifically is trained to handle tax issues. In order to receive their status as an enrolled agent, they need to pass an intense exam that covers all parts of tax code. The only ones who do not take this exam are those who worked for the IRS for five years in a position that demanded they be familiar with interpreting tax code and applying its regulations. Enrolled agents are a good option when you need representation during IRS collections, audit investigations, reducing penalties, or offers in compromise. If you are contacted and are told to expect an audit, yet you believe that you did not commit a tax crime or you didn’t file a required form, then you may choose an enrolled agent to help you first. When it doubt, it’s never a bad idea to contact a tax attorney. The best part of reaching out to our offices is that we can guarantee attorney-client privilege. As we mentioned before, this means that we cannot be forced to testify against you in a court of law. Our team of professionals is prepared to work with you and help you as you seek the best possible outcome for your case. Contact us today to schedule your free consultation. You can tell us more about your situation, and we can inform you how we may best be able to help you. We look forward to working with you and the IRS to come to an understanding. With previous experience working for the IRS, our attorney, Jeffrey Anton Collins, is prepared to represent clients in Wheaton, Lisle, and the rest of the Chicago area. As an authority on U.S. Tax Code, as well as ongoing cases, you can be sure that you will be working closely with a professional. We’ll talk to you soon!